Webcomicography is a weekly article from Champion City Comics that goes behind the scenes of our webcomics to give you the complete story. The Champion City Fire is the first title we published and is the first to be examined in this series. If you missed part one then click here to read and click here to read part two. Denny O'Shea is dead and now it is time for the police to investigate. 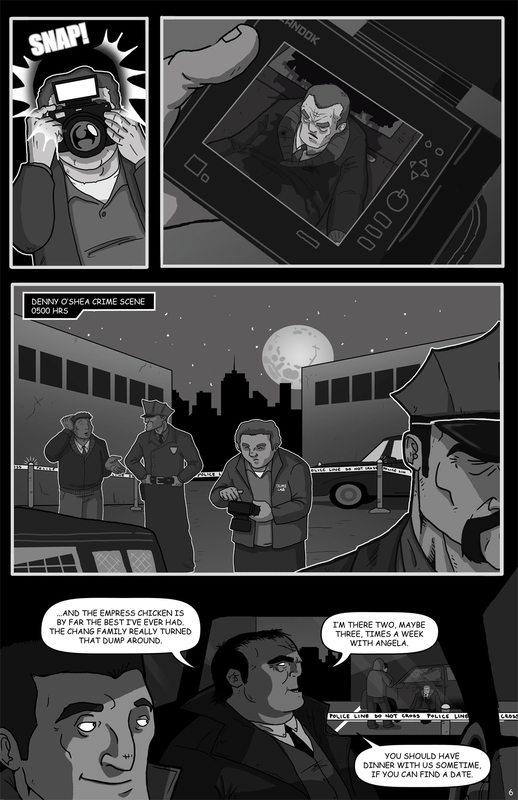 Page six, which is posted below, gives us the first glimpse into the world of the New Ravenwood Police Department. 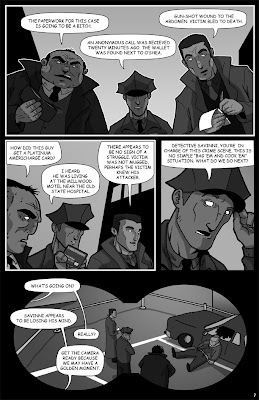 Detective Al Savinni, the guy doing all the talking in the fourth panel, is the veteran detective and seated next to Savinni is Detective Ryan Foley, his partner. I like to mention food in some of my stories and a local Chinese restaurant was serving some great empress chicken when I was writing this story. I'm pleased to say that they still are, so I hope I didn't jinx myself. The detectives are introduced and it is time for them to get to business. Page seven, which is posted below, shows the detectives in action. They are investigating a murder in New Ravenwood's 'skid row' section, so the basic procedure is to send all skid row victims to the morgue to be cremated because they are vagrants who will not be missed. However, Savinni and Foley can not do that with this investigation because the victim is Denny O'Shea. Also, I took a more comic book/Hollywood approach to the detective work because it is more entertaining than basic paperwork, chalk outlines, etc. 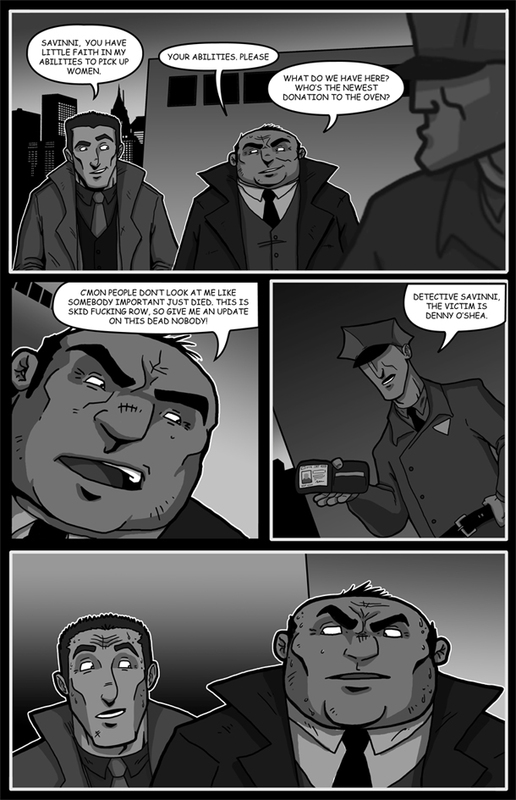 Page eight, which is posted below, starts to develop Savinni and Foley as characters. Savinni is a big mouth complainer while Foley seems to be a by-the-book type of guy. I added a third person into the discussion because my idea was to give some balance to Savinni's complaining and Foley's stiff persona. I never gave the cop a name but planned on having him show up again in future pages. The last panel is viewed through binoculars and introduces two new characters. Their role in the story is that they know about the time travelers who are murdering criminals in New Ravenwood and their plan is to expose the truth X-files style. Next Friday we will examine the remaining pages of our story and I hope you've enjoyed Webcomicography.